You can also donate your County Fair Savers cards and stamps and your Coborn's food and gas receipts. County Fair donates $0.55 for each card we turn in (in bundles of 50) and Coborns donates 1% of the total receipt value to Mitchell Animal Rescue. We have several locations in Mitchell (listed below) where you can leave them. Of course these jars also accept money if you choose to help us that way. Please patronize County Fair and Coborn's for helping us AND please patronize the businesses that are kind enough to host these collection jars for us. The Patzer family (of Patzer Woodworking) is holding an ongoing fundraiser for Mitchell Animal Rescue. 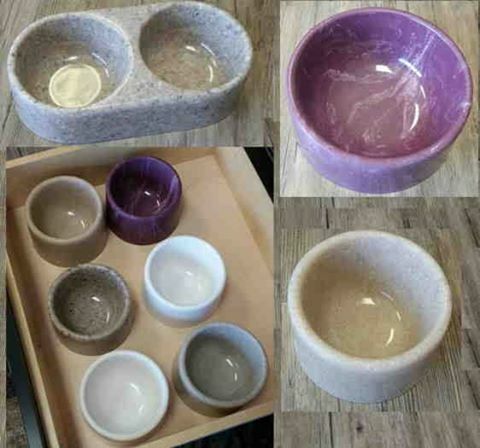 Their sister company – Sioux Marble in Brandon – has leftover marble on a regular basis and puts it in molds to make amazing durable and heavy dishes for dogs and cats. Prices are $10 for a small single bowl, $15 for a medium single bowl, $20 for a large single bowl and $25 for the double bowl. All proceeds from the sale of the bowls in Mitchell will go to Mitchell Animal Rescue. Buy now .... Buy Often!!! !